A Resolution is scheduled to be moved in the House of Assembly today pertaining to the salaries for Ministers and Members of Parliament. 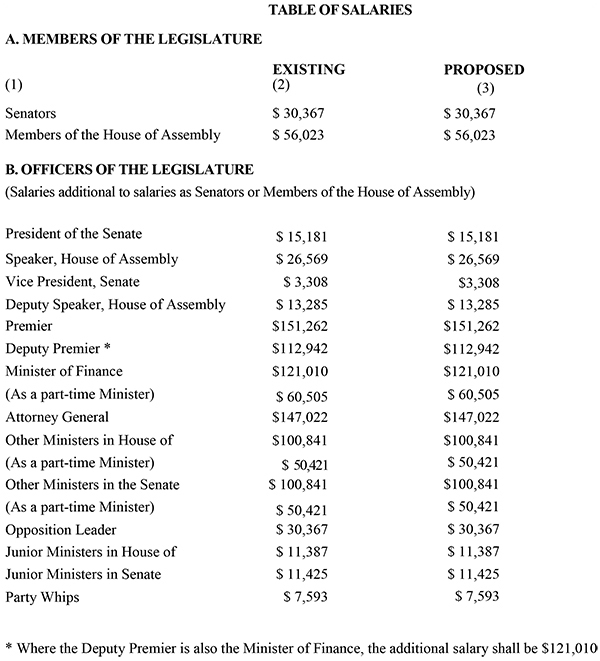 The proposed salaries are the same as the existing salaries with MPs earning $56,023, with additional payments if they hold other positions, such as $151,262 for Premier, $147,022 for Attorney General, $112,942 for Deputy Premier, $100,841 for other Ministers, $30,367 for Opposition Leader and $26,569 for Speaker of the House. Poll: Should We Reduce Size Of Cabinet & MPs? Why do we need 36 MPs for an island of just 60,000? - Barbados has 30 MPs and has almost 290,000 citizens. - Jamaica has 63 MPs and almost 3mn citizens. You want to save some money then slash the number of MPs to 2 a parish. And they’re not exactly performance based are they? There are some obvious jokes about value though…. Exactly. Get rid of half of them. Crazy savings per term. Excellent way to start saving money! What a waste of time and paper, still calling for 50% cut in politrickster wages. And the schools are in sheet shape, when we where told they are perfect. A shamble of a bus service. a lot of dead weight in the cabinet just collecting a wage. Well done voters, wont be long. Hey, what did the OBA do for public education??? Obviously not enough…just so you know, the OBA aren’t the government. It’s a shame they keep thinking they are still in opposition, proven they don’t know how to govern. The oba is sooo notorious. Their earnings as government were not posted. It warms my heart to think that your intense hatred of anything non PLP is so strong that you probably have serious trouble sleeping at night trying to think of how you’re going to come up with yet another lie filled twisted mis-truth of a post here at your next and earliest opportunity . How could it sleep with that foul taste in its mouth? Two MP’s per Parish and call it a day. Most members are voted in with something like 600 votes. Ridiculous.